CS induces kidney injury in a murine model of COPD. 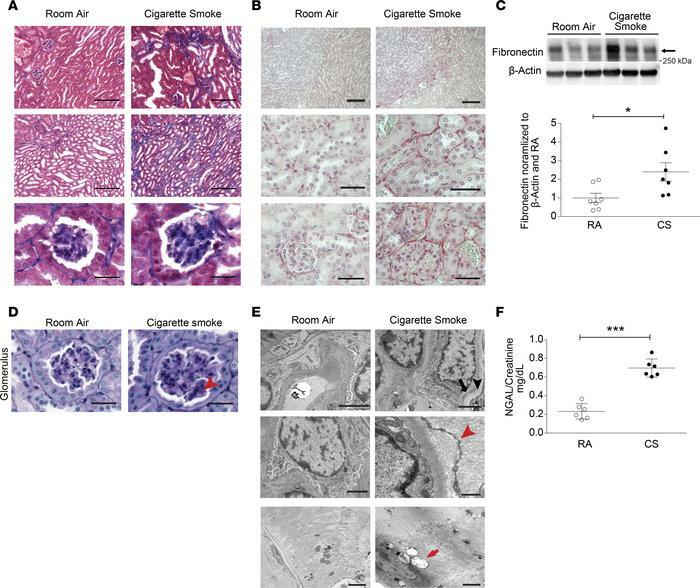 Kidney sections from mice exposed to room air (RA) or cigarette smoke (CS) for 6 months were stained with (A) Masson’s trichrome or (B) Sirius red. Scale bars: 50 μm and 25 μm (magnified images). (C) Western blot for fibronectin expression in kidneys after RA or CS exposure (n = 7 for each group), representative of 3 independent experiments. Graph represents quantification of Western blot data normalized to β-actin and RA control. (D) Periodic acid–Schiff (PAS) staining of kidney tissue from mice exposed to CS for 6 months, showing increased glomerular basement matrix content (arrowhead) relative to RA control. Scale bars: 25 μm. (E) Transmission electron microscopy (TEM) of kidney sections after 6 months of CS exposure, displaying podocyte foot process effacement (black arrow) and glomerular basement membrane thickening (black arrowhead), interstitial collagen deposition (red arrowhead), and cytoplasmic lipid droplets in tubular cells (red arrow) relative to RA control. Scale bars: 2 μm and 500 nm (collagen deposition in CS group). (F) Urine neutrophil gelatinase–associated lipocalin (NGAL) levels quantified by ELISA (mg/dl), normalized to urine creatinine after 6 months of CS exposure (n = 6 per group). All data are mean ± SEM. *P < 0.05, ***P < 0.001 by 2-tailed Student’s t test.